No need to carry an extra flashlight when using this sturdy screwdriver. Features 6 different screwdriver bits, including 3 Phillips and 3 flat heads. 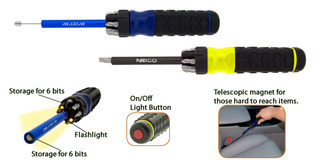 Also includes 2 lights and a magnetic pointer that extends 406mm for those hard to reach places. Includes 2 AAA batteries packaged separately. Pad print only on this item.